concrete thinking - Shaping the Child parenting... because ​parenting is Not for wimps! WHAT IS CONCRETE THINKING WAY AND WHY IS IT IMPORTANT TO UNDERSTAND? ​What is concrete thinking anyway and why is it important to understand? Concrete thinking is a normal part of life for children between four and six years old. They do not yet have the logical thinking required to make sense of things, for example, when there are two different meanings to words, just as the case below illustrates. 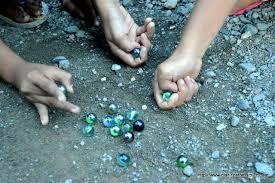 Sure enough, the kids had been playing with marbles and were repeatedly asked to pick them up. My daughter tried to explain the importance of keeping track of such small items and that we “don’t want to lose any of our marbles.” To which my son-in-law quickly added, “Yeah…like Ama. She has lost all of her marbles.” It was pretty funny. That is a perfect example of a concrete thinker. You say it, they believe it. ​I bring this up because when children see and believe things only one way it can create "faulty thinking" or "stinkin' thinkin'" as my good friend, Shawna Burns discusses in her new book, Seed Digging. She mentions that most children have illogical thinking, also known as concrete thinking, which is very typical in early childhood and can even continue as late as the tenth year. Problems can occur immediately and possibly create a lifetime of problems if not addressed. ​This is why it is so important to be aware of your children's responses to situations. Anger, fear, nervousness, agitation and crying often and easily are just a few of the hints. These are some good clues to be aware of when you children are young. You may want to be aware of what “normal responses” are concerning appropriate age behaviors of your children. By being aware of these things, it may help you to be more patient and empathetic and less likely to get angry or minimize the tears. These things might be great clues for you as a parent to know when there is a problem. This may be tricky around the 4-6 year old stage, because they seem to cry about so many things. However, even at this time, there may be real problems that are more serious than just tears of disappointment or not getting their way, etc. Talk to your children and help them feel safe talking with you about how they feel. Remember, your reaction to them will likely determine if they “feel safe” sharing their feelings with you. So, treat them tenderly because those feelings can help to decipher problems that you may not be aware or before the problems and the consequences become severe. Do you have any good stories to share concerning concrete thinking? I’m sure there are many, many stories out there (many are really funny) that give great examples of the concrete thinking of children. If you have a story about concrete thinking that you would like to share? Please do. If you have a funny story, I would appreciate it if you would share it by going to the Play tab and then submit under Funny stories. Thanks for sharing!